In this Photoshop tutorial we will add our own watermark sign to an existing photo. Photoshop tutorial by Blue Lightning Tv showing how to create an action that will instantly transform your photos into the look of beautiful, impressionist paintings. Learn how to create this dark photo manipulation of an spirit ritual in Photoshop. In this tutorial, you’ll learn how to change daylight image into dark night using techniques, create a light effect, painting human hair and blending techniques that will help you create better dark scens in Photoshop. Throughout the tutorial, you’ll learn techniques that will help you create dark concepts in photoshop. In this tutorial I’ll show you how to create an abstract artwork by combining several stock images with abstract elements in Adobe Photoshop. Besides standard blending techniques with adjustment layers, masking and brushes, you’ll also learn how to make an abstract object using Adobe Illustrator, apply texture, enhance the depth of field and more. In this Photoshop tutorial by Serge Ramelli you will learn how to use textures to completely change photos and bring amazing life to them. Here, you will learn how to make an epic photomanipulation in medieval-fantasy style and you will compose a dropped sword in the background of battlefield. You will learn how to mix stock, use transforms and how to change colors on further photomanipulations. And You will know how to use blurs and colors in making perspective in photomanipulations. Welcome! Today we’re going to be looking at some methods and techniques to composite a si-fi crash site scene. I’ll be talking though selecting stock photos, lighting methods, and extraction methods for things like smoke. This kind of imagry is great for backgrounds but mostly these techniques will help you expand your own toolbelt to create more advanced and interesting work! In this tutorial we’re going to create a cute purple mascot for Spirit Day. 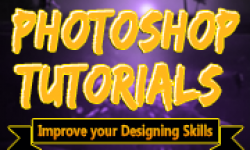 In most of my tutorials you can see me using Blend Modes to create shading. This isn’t the most natural way, though, so this time I’ve prepared something for fans of a more traditional approach. With just about everyone using a smart phone, it is important for mobile apps to have beautifully designed icons to represent the brand. In this tutorial, we will show you how to create a beautiful 3D starfish icon using several applications including Photoshop, Cinema 4D, and ZBrush. In this tutorial we will create an underwater scene with various elements and an overall mysterious atmosphere. We’ll use most of the Photoshop power tools: layers masks, adjustment layers, smart objects and more. It helps if you’re an intermediate user but beginners will also be able to follow this tut and learn about various precious techniques. Let’s begin! Nicolas Monin-Baroille created this tutorial’s artwork for a book accompanying last year’s OFFF creative festival in Barcelona. He says that his aim with the piece was to have something in his own style that was messy and calm at the same time – and in keeping with the event’s them of ‘Unknown Disorder’. “Low-poly self portrait tutorial” is a Photoshop tutorial created by Brazilian creative director Breno Bitencourt. In this tutorial, Breno Bitencourt will show you how to create a low-poly portrait in illustrator and Photoshop step by step. The main techniques used here are masks and blending modes, Photoshop’s auto contrast, auto colour and auto levelsfunctions.